The Japanese Bridge is Hoi An’s signature landmark used widely as an emblem of the town. It was built by Japanese merchants in the 16th century. The bridge was originally constructed to connect the Japanese community with the Chinese quarter separated by a small stream of water, a symbolic gesture of peace. Hoi An, an enchanting ancient town located in Quang Nam province, central Vietnam, was once a major trading port of Southeast Asia in the 16th century. It was previously known by various names—Fayfo, Haifo, Kaifo, Faifoo, Faicfo, Hoai Pho—meaning “peaceful meeting place”. 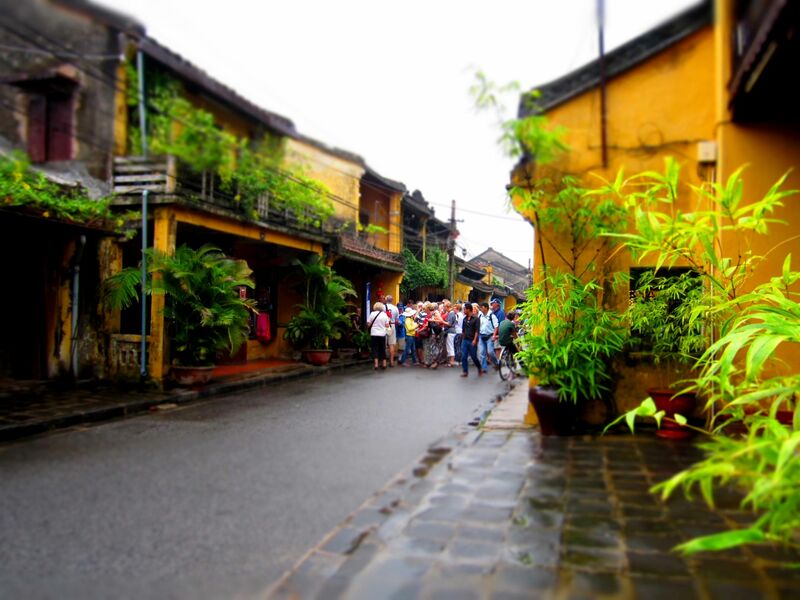 With the total area of 60 square kilometers, Hoi An has plenty distinct Chinese architecture with low tile-roofed houses and narrow streets, some of the first built ones remained almost intact. This little town is nominated as World Heritage Site by UNESCO for its rich cultural heritage. Most of the town’s grand heritage listed buildings date back to French colonial times in the late 19th and early 20th century. The oldest houses have passed four at least 5 generations, and are quite distinct from those of the colonial era. A handful of these older merchant houses are open for visitors. The three top houses to visit are Duc An, Tan Ky and Phung Hung. Hoi An’s old streets are packed with houses dating back to its emergence as an important Asian trading port in the 18th century. The houses reflect the architectural styles of the major trading partners of the time—China, Japan, as well as the former European occupying force in Indo China, France. You will be greeted by old yellow buildings with their Chinese-ornamented windows and doors neatly lined up along the small street. Hoi An is not big. It only consists of a few blocks. But it is also one of so many factors that makes tourists feel immensely satisfied roaming the streets and eager to explore every hidden corner in this small town . Motorists are not allowed to enter the streets in the main area except at certain hours, which makes it a very tourist-friendly place. There is something inexplicable about this little town, something that induces a feeling of longing that chants ” I’m coming…here I am”. Nostalgic is probably the closest word to describe the feeling. Even if it is the first time you set foot there, you will stop for a moment to take a breath and say to yourself, “I’m home”. You could feel that every wall and corner sing a tale of the past. The windblow from the sidelines between a small alley seem to try to gush, “I witnessed a lot of tales from time to time”.